Her tongue is long and sticky, according to those who’ve touched it. Her diet is hardly picky. Ants? Of course. Yogurt? You bet. Avocado? Oh my gosh, yes. And her appearance is unlike anything you’ve seen in Tallahassee, except for maybe her armored Florida-dwelling cousin, the armadillo. She’s a giant anteater, the newest special guest at the Tallahassee Museum. The Tallahassee Museum got the animal on loan from the Brevard Zoo in Melbourne, and she’ll stay here into the spring, officials said. The new exhibit opens to the public on Friday. Museum officials and employees invited media members to see the anteater on Thursday, and they watched and talked with delight as the animal roamed her wooded and watered space at the 52-acre outdoor landmark. The anteater rarely stood still, exploring her new sights and occasionally stopping to dine on her base meal, a mixture of proteins and fatty acids mixed with water, orange juice and banana. 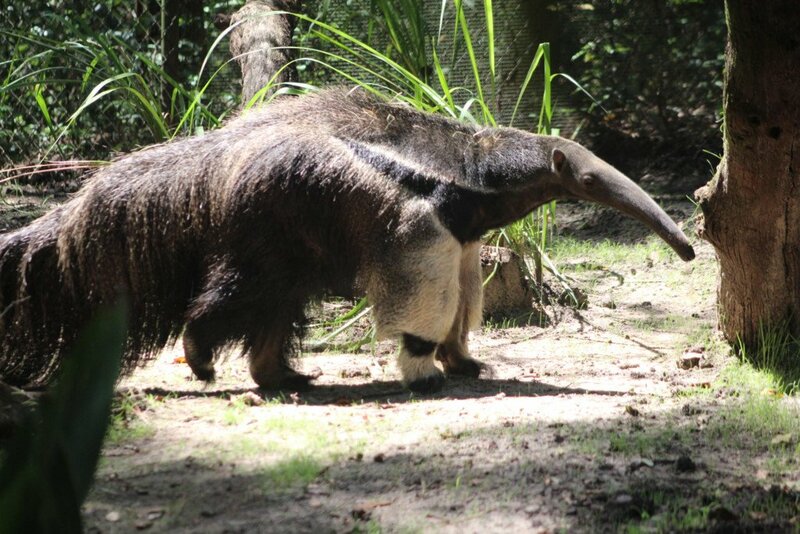 In the wild, anteaters supposedly eat up to 30,000 ants a day. But this one is getting the pampered-insectivore treatment. Anteaters don’t have teeth and prefer their food soft and mushy so that they can lick it. Before offering new foods, animal handlers seek guidance from the Brevard Zoo, officials said. The giant anteater is native to South America and Central America and can live into their late 20s in captivity, Augustine said. The Tallahassee Museum’s visitor is 17 years old and has had two babies. She weighs 88 pounds, with a more imposing appearance than you might expect. Armed with big, sharp claws, anteaters can be dangerous if threatened. A YouTube video posted last year shows a giant anteater fending off a jaguar. The giant anteater follows a long list of special guests to the Tallahassee Museum, including lions, tigers, monkeys and rare otters and birds of prey. “We can compare and contrast these animals to our native animals,” Buzzo said, pointing out that the museum’s wildlife trail features animals native to Florida. She said the newest guest has a name but that the museum prefers not to share the names of animals in captivity. The practice reminds visitors that they’re wild animals. “You would not want any of these animals as a pet,” Buzzo said.